The campaign for President of The United States of America is over. Months of intense debates resulted in the election of Donald Trump. Although those who supported him are celebrating, all of us realize the political campaign also pulled back the curtain on how divided this nation is. Personal attacks, racial violence, attacks against women, immigrants, and Muslims all reveal ideologies that undermine generations of progress in human rights. In this time of deep division, we members of Metropolitan Community Churches are called to reaffirm our values of community, inclusion, social action, and spiritual transformation. We must recommit to liberty and justice for “We the People,” not just for the majority or for powerful people and corporations. We are called to resist the divisiveness of this election season from becoming our way of living. We are a people who value spiritual transformation in strong communities of inclusion and social action. We, as people who represent incredible diversity of your holy creation, pause in this hour. Many of us are gathered after many hours of anxious waiting. We are experiencing deep pain of division. The division of this time pierces our hearts. It is a division we are struggling to resist, yet we feel the tension and the pressure of this division within our families, where we live, and the nation. In our anxiety, we learn from Jesus that love is greater than fear. In this hour, we pray for those who are afraid. Those who have lost hope because they are vulnerable. We hear the voices of African-Americans, Latinos and Latinas, Muslims, and others who feel alienated. We hear the voices of fear from the LGBT community who are afraid the rights they have now come to experience, may be erased. In times of fear and uncertainty, we believe that even in brokenness, God makes way for new life. We pray for all of those who are feeling brokenness. In these late evening hours, we are challenged to hear words that reflect the values of your teachings Jesus. Values that cross political lines and fuel our core faith. Some are asking what happened to the teachings to love your neighbor, welcome the stranger, care for the poor, forgive and free the oppressed. Even in times of uncertainty, we honor these values as a foundation of our faith, but we are unsure how they will be lived out. Divine and loving Spirit, we offer ourselves to live as communities of care and grace. Communities of inclusion and social action, communities of worship and prayer, places where we are listening and starting conversations. 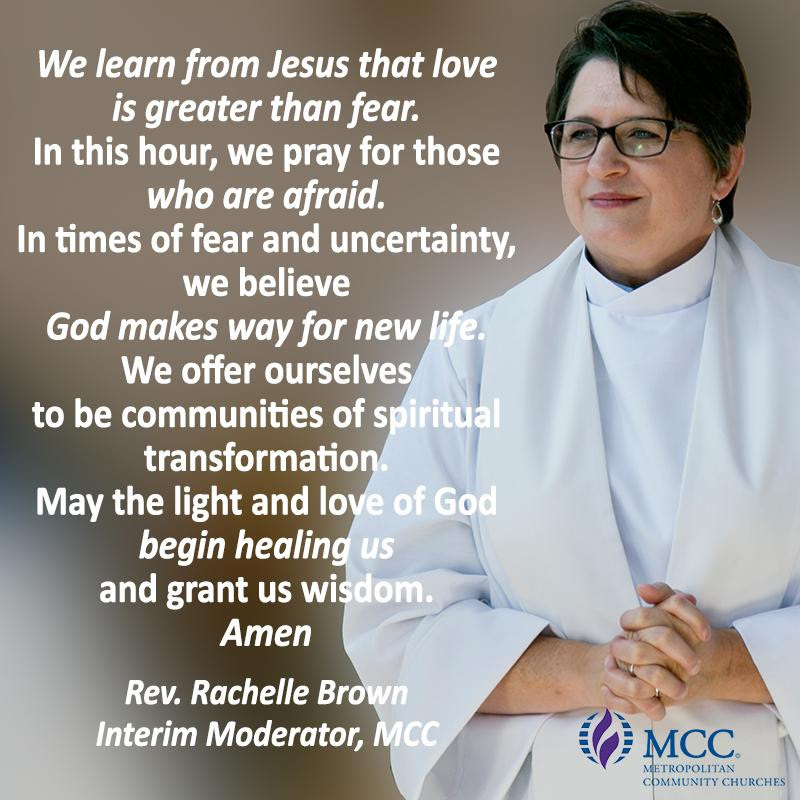 Now, in this time of prayer, we offer ourselves, in a commitment to be communities of spiritual transformation. May the light and love of God surround us, begin healing us, and grant us wisdom. Amen.